SyFy monsters: Scary species that should be movie stars. I’ve never seen the offices of the SyFy channel, but somewhere in the building must be a room with two corkboards that are plastered with photographs. The one on the left features a menagerie of creatures both real and mythological—sharks, crocodiles, Bigfoot, the Loch Ness monster—while the other features washed-up actors and forgotten pop stars. When SyFy plans a new film, I believe, someone on its creative team is blindfolded and throws a dart at each board to determine the subject and star. But one day, by accident or as a joke, someone must have thrown two darts at the left board. Direct hits on a shark and an octopus. That’s the most reasonable explanation I have for the origins of Sharktopus. And just then, the minds of the SyFy channel filmmakers lit up. Movies about killer creatures of one stripe or another have been done to death. What about combining two terrible things to make them even worse? Piranhaconda was spawned soon after, and the recent Sharknado is the mind-numbing extension of the same schlock logic. While the sub-sub-subgenre of amalgamated creatures already feels tired, SyFy is determined to run the concept into the ground. At least two Sharktopus sequels are in the making: Sharktopus vs. Pteracuda and Sharktopus vs Mermantula. The point isn’t to create something original or even good, reports Dread Central, but to concoct movies so outlandish that potential viewers will talk them up out of “can you believe this?” puzzlement. For a while, I followed the “so bad it’s bad” fun of SyFy’s movies. I grew up watching creature features, and Mystery Science Theater 3000 taught me the pleasures of riffing on atrocious below B-grade sludge from the comfort of my couch. But I’m just not that interested in the shoddily created, ratings-grab hybrids SyFy plans to put out, especially when there are real organisms that could be as frightening as any Tyrannotula or Saberdile. There are plenty of monsters—living and fossil—that deserve starring roles in their own horror movies. 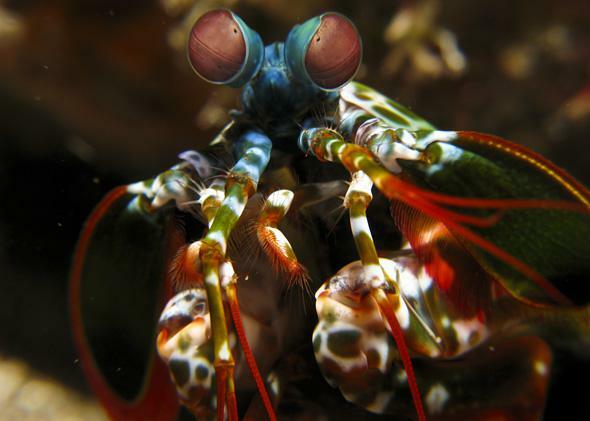 I’m shocked that there has yet to be a film starring a stomatopod, better known as mantis shrimp. Photographer Jason Isley’s shot of a mangled miniature figure outside the burrow of one of these invertebrates is the perfect concept art. 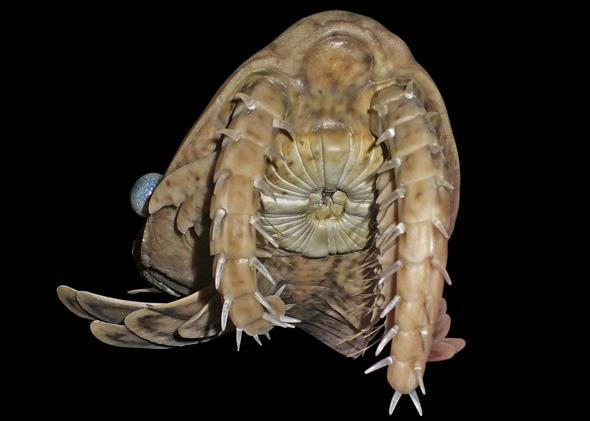 Not only has evolution given the mantis shrimp an imposing and alien appearance, but the feeding techniques of these arthropods are astonishingly terrifying. The clubs of some mantis shrimp species can strike prey at 50 miles per hour—so fast that the attack creates a little flash and mini shockwaves that crack and burst the armor defenses of prey. Then again, the majority of mantis shrimp species seem to be stabbers rather than punchers. While their stabs are not quite so fast as the punches, mantis shrimp that spear their prey nevertheless bear intimidating, spring-loaded claws that are exquisitely adapted to snatching prey. All that filmmakers would have to do would be to pump up the size of the mantis shrimp—the largest of the 400 or so species is about a foot long. Still, an inflated mantis shrimp is less of a stretch than a Sharktopus. The mouth of an Anomalocaris. The model was made by Espen Horn of the State Museum of Natural History in Karlsruhe, Germany, in life size (about 60 cm) based on fossils from Canada’s Burgess Shale. But if we’re talking hypothetical sea monsters, I don’t think anyone could do better than the 515-million-year-old Anomalocaris. This invertebrate was one of the Cambrian Period oddballs found in Canada’s Burgess Shale, and it was so bizarre that it took decades for paleontologists to understand what the entire animal looked like. An archaic forerunner of arthropods, this exoskeletal wonder possessed a pair of spiky “raptorial appendages” bordering a mouth that resembles a camera shutter of doom. Propelled by undulations of oar-like fins along the sides, Anomalocaris may have grasped small prey with those coiled appendages and fed them directly into its multipart mouth. A backstory to explain the long persistence of this early predator and a bit of a size boost would be all that’s needed to have a readymade Hollywood monster. 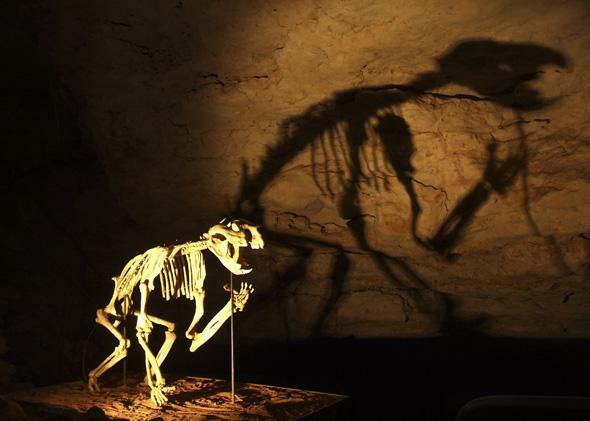 A reconstructed Thylacoleo skeleton in the Victoria Fossil Cave of the Naracoorte Caves in Australia. There are terrestrial terrors worthy of a starring role, too. I’d love to see a revived Thylacoleo tear up the screen. One of Australia’s lost megamammals thought to have disappeared a scant 46,000 years ago, Thylacoleo was a leopard-size carnivore descended from the same lineage as wombats and other marsupial herbivores. While this animal is sometimes called the “marsupial lion,” the overall appearance of Thylacoleo is more akin to a killer koala with meat-cleaver shearing teeth. And based on studies of the marsupial’s specialized claws, paleontologists suspect that Thylacoleo was adept at climbing trees. You can see where I’m going here. The Australian version of the “snipe” of American snipe hunts is the legendary “drop bear,” said to be a ravenous version of a koala that drops from trees on unsuspecting victims. Thylacoleo could be the star of Drop Bear: Death From Above. 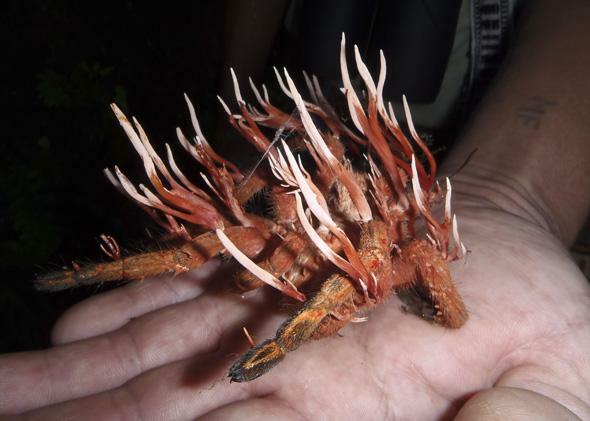 Cordyceps ignota infecting an unknown species of tarantula. This species of fungi is parasitic on tarantulas. At this point, the fungus has consumed the tissues of the spider and has fruiting ascocarps that produce spores. This infection kills the tarantula host. This picture was taken in the Santa Lucia Cloud Forest Reserve in Ecuador. Movie monsters need not look scary to be absolutely abominable, though. In mulling over my wish list, I kept coming back to an organism that doesn’t look frightening but whose horror lies in manipulation of other creatures. I’m speaking of the fungus Ophiocordyceps. Species of this genus regularly hijack the bodies of ants and other insects for their own ends. Once the fungus takes hold of an ant, the insect gradually becomes a zombie that seemingly has no urge other than to climb to the highest point possible. Once there, the ant sinks its jaws into a leaf as the fungus—which has been growing inside this whole time—erupts through the head of the poor ant to rain down spores on other unsuspecting victims. Now imagine of Ophiocordyceps found a way to colonize our species. Such a scenario could enliven the tired, shuffling zombie subgenre. 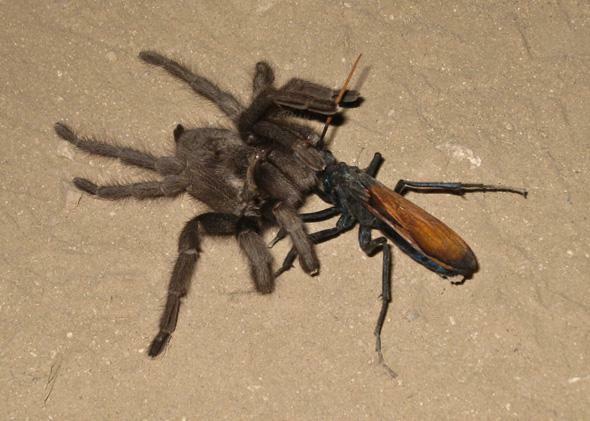 A tarantula hawk wasp drags an envenomed tarantula across the ground. There are scores of other organisms I could mention. The tarantula hawk has horrified naturalists for years. It is a wasp that stuns the hairy spiders and lays an egg on them that then hatches and eats the tarantula alive. Another perfect candidate is the remipede, a crustacean that liquefies its prey’s insides with venom. Even speculative spins on familiar animals will do—imagine a rampaging, carnivorous giant ground sloth. Nature, past and present, is replete with frightening animals. This is simply a short list of some of my favorite candidates that I believe horror filmmakers have overlooked. Truly, creature features would be so much richer if film companies hired paleontologists, marine biologists, and other experts as advisers. Sharks, crocodiles, and spiders have had their day. Bring on the shutter-mouthed fossils and zombie-creating fungus!